Our custom harnesses and coats were originally developed for the hard to fit breeds that are prone to back problems and IVDD. By using our measuring guide below, our custom clothing fit any breed. Made of durable, cool, poly-knit mesh. Easy to put on with hook & loop closures. No straps, rubbing or choking. Transfers pulling pressure to chest area. All come standard with a quick-release buckle at the chest to ensure your pet is safe and secure. 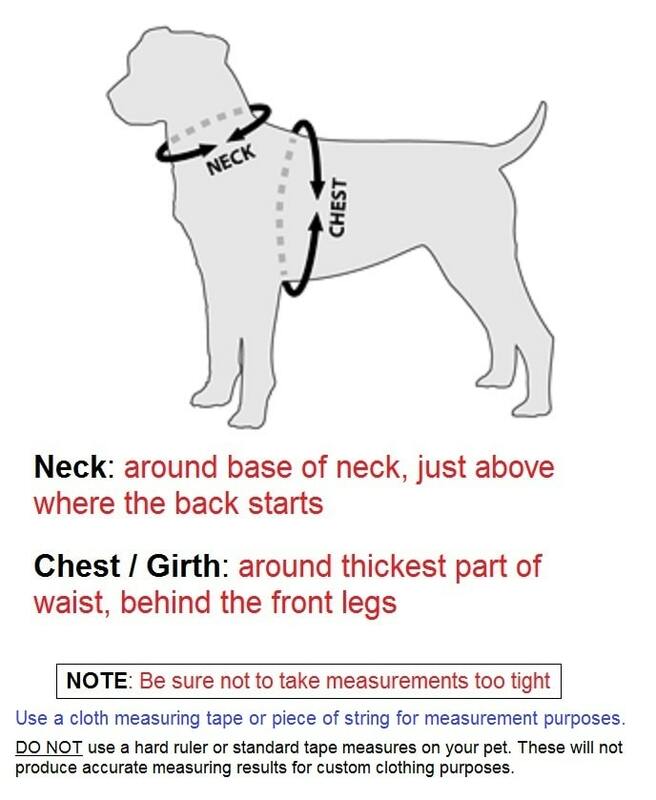 PLEASE FOLLOW THE DIAGRAM AT BOTTOM OF PAGE TO MEASURE YOUR DOG PROPERLY. Our mesh dog harness is custom-made to fit your dog. Don't waste your money on a pre-made harness that is made to fit a variety of different sized dogs. Our harness is hand-tailored to fit one dog only - YOURS. Our harness offers the BEST FIT possible for your pet. * Safety latch/seat belt handle offers freedom and security while driving in a car (see photo). Veterinary Approved and each is made by hand and sewing machine. We specialize in clothing for the hard-to-fit breeds. We pride ourselves in supplying the best quality and innovative dog apparel. * No more choking. All pressure goes to chest area. Please allow 15 business days to make your custom-made mesh harness. BE SURE TO MEASURE CAREFULLY. THERE IS A $10 ALTERATION FEE FOR HARNESSES RETURNED DUE TO INCORRECT MEASUREMENTS. This is our third Dachhound and we have never had a harness that fits. We took his measurements and ordered his mesh harness and it fits like a glove. Great design. This harness is easy to put on and durable. Our little weiner cannot be out without her leash. She would be gone in a flash after a chippy or deer. It is too dangerous for her to be by herself as there are too many predators such as foxes, eagles, wolves, coyotes. This harness gives us peace of mind. This is our Dachshunds second harness and we LOVE them!!! Measured as required and the fit was perfect both times. Do not hesitate to order from this company...product and customer service is great. This is my third order. The harness are beautifully made and the custom fit is fantastic. Easy to put on and off . Will plan to order more! I LOVE this. Perfect fit. Well made.